Does your page use Facebook events? 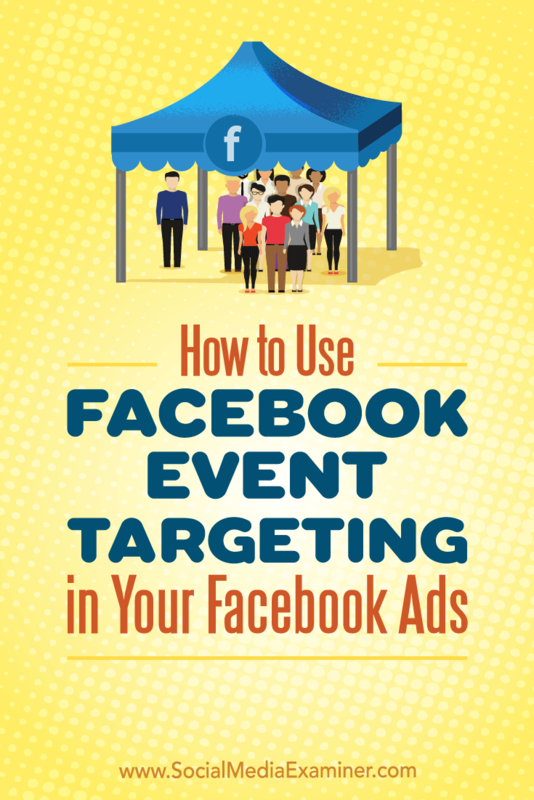 Want to retarget ads to people who engage with your events on Facebook? 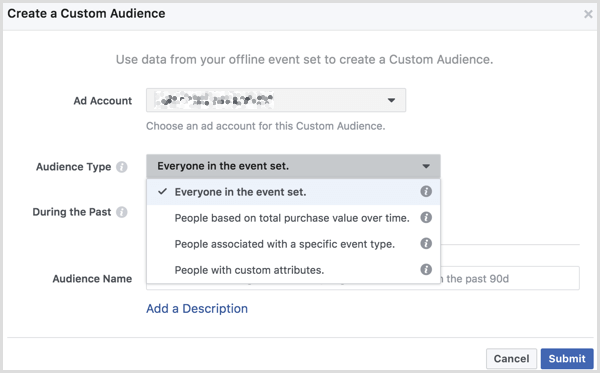 In this article, you’ll discover three ways to target audiences using Facebook event engagement custom audiences. How to Use Facebook Event Targeting in Your Facebook Ads by Kristi Hines on Social Media Examiner. 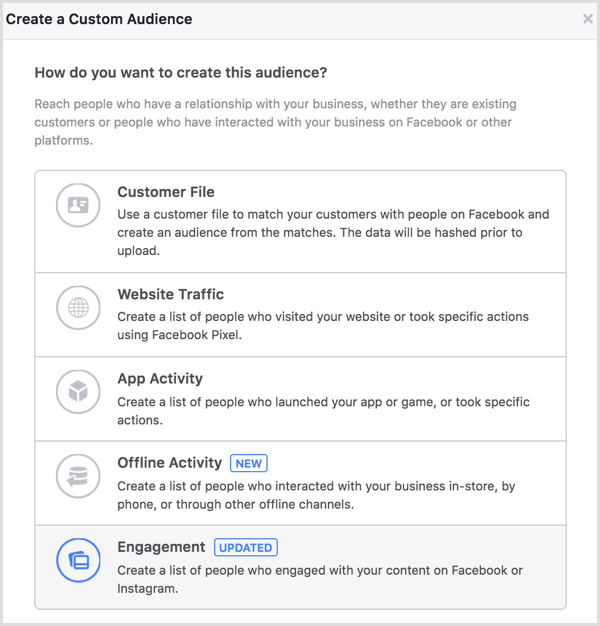 The fastest way to target people who are going to your Facebook event is to include or exclude them in the Connections section of the Audience targeting setup in Ads Manager. Click Add a Connection Type, hover over Events, and select whether you want to include or exclude people who have responded to your Facebook event. After you make your selection, the Add an Event field appears below the option you selected. You can also select Advanced Combinations from the Add a Connection Type drop-down menu and include or exclude people who are connected to your Facebook event. You can only include or exclude people who are going to your event; you can’t target friends of people who have responded to your event. Click the Save This Audience button to save this audience for use in other Facebook ad campaigns. Then add a name for your audience so you can easily identify it for future ads and then click Save. 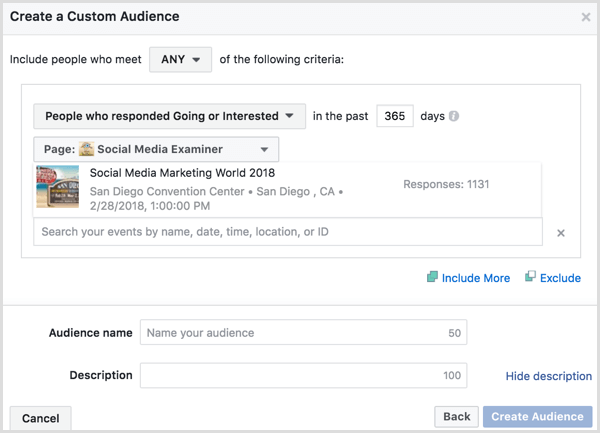 To get a little more specific about the people you want to target based on their engagement with your Facebook event, you can set up a custom audience for Facebook event engagement. To create a custom audience, open the Audiences dashboard in Ads Manager. In the Audiences dashboard, click Create Audience and select Custom Audience from the drop-down menu. You can also create new custom audiences in Ads Manager while creating an ad. In audience targeting, click Create New under the Custom Audiences field and select Custom Audience. Next, select Engagement as how you want to create your audience. To create this audience, choose Event. 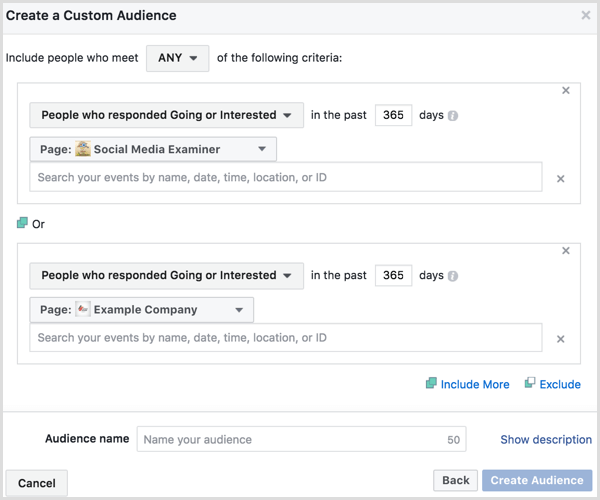 You can choose to create a custom audience based on people who meet any or all of the Facebook event engagement criteria you enter. Then select people who are going to or interested in your Facebook event. 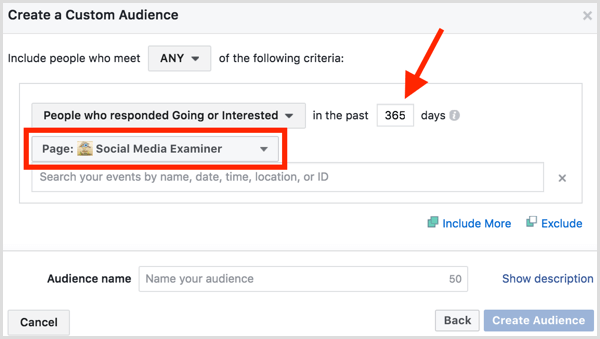 Enter the number of days you want the event engagement custom audience to cover and choose the Facebook page you used to create your Facebook event. Select one or more Facebook events. You can hover over each Facebook event to see a breakdown of the number of people who are going to or interested in the event, along with additional details from the Facebook event page. Continue to include or exclude more Facebook events from other Facebook pages as needed. When you’re done setting up your custom audience details, click the Show Description link above the Create Audience button to name and add a short description to your custom audience. Then click the Create Audience button. You can select this custom audience in audience targeting when creating new ads in Ads Manager. You can also view the audience from the Audiences dashboard. 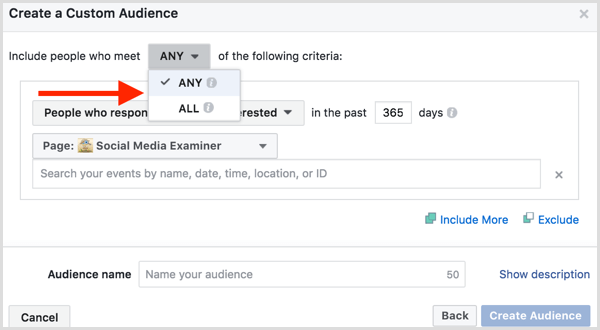 Once the audience is populated, check the box next to it and click the Create Ad button above to create a new Facebook ad campaign with your custom audience as the target. 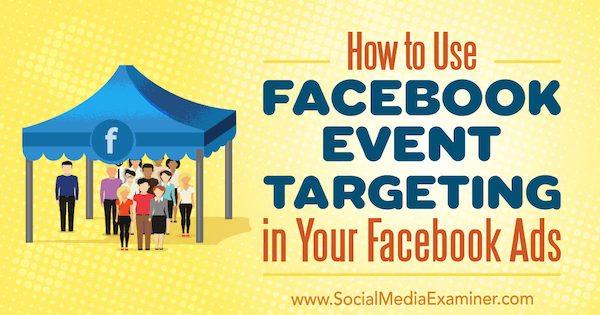 Do you want to target Facebook ad campaigns to people who actually attended your event? If you collect information from people while they’re physically at your event, you can use that data to create a custom audience based on offline activity. First, you need to create an offline event with the data you collect from attendees at your event. To do this, you must use Business Manager to manage your Facebook ad account. Inside Business Manager, navigate to Offline Events under the Measure & Report section. On the following screen, click Add Data Source and select Offline Event Set from the drop-down menu. Name the data you plan to upload. For example, if you upload information from everyone who checked in for a badge or registered at the door of your latest event, name and describe the offline event set accordingly. Once you’ve named and described your offline event set, click Create. 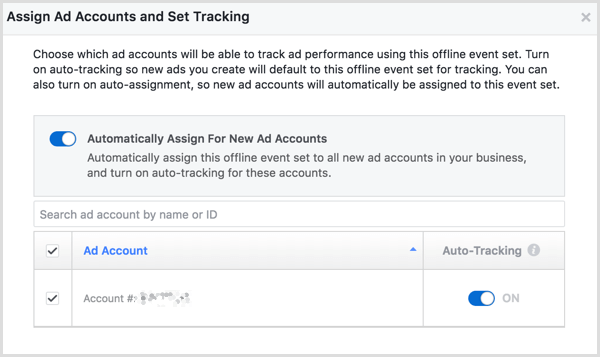 Next, select the Facebook ad accounts with which you want to use this offline event set and click Next. Confirm the assignment to your ad accounts in the resulting pop-up and click Done. Then click the Upload Offline Events button. On the next screen, you’ll upload the information you collected from your event attendees. Facebook’s sample data shows how your information should be formatted. 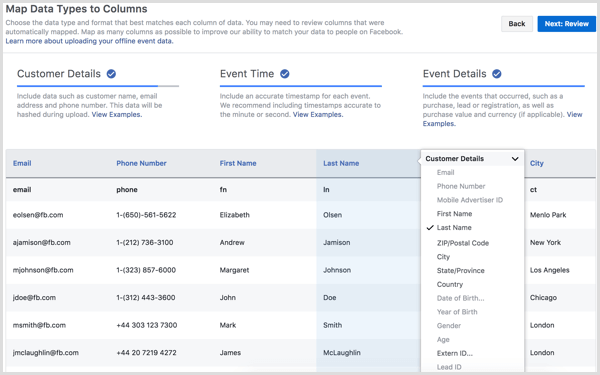 While not all of the information is required, you can see everything that can be included in your offline event set CSV file on the Facebook Business support site. Attach your CSV file and then click the Next: Map Data button. 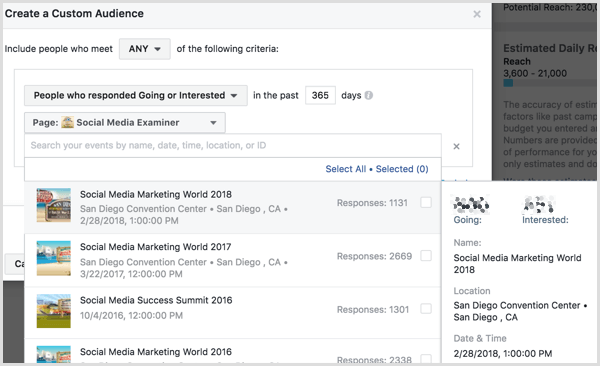 Now you’ll match the data in your CSV file with the data Facebook can work with to create your offline event set, and then click the Next: Review button. Facebook will analyze your data and let you know if there are any issues. When you’re ready, click the Start Upload button to start creating your offline event set. 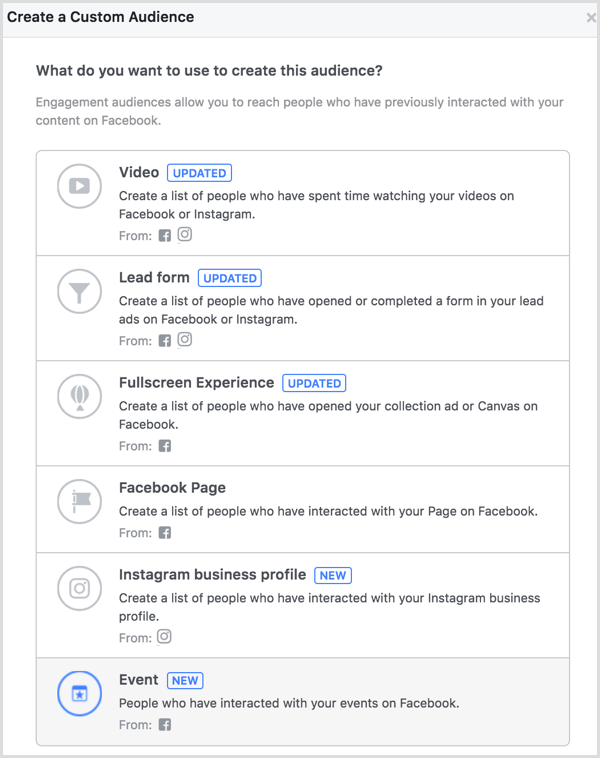 As Facebook compiles your data, it will use the email addresses and phone numbers you uploaded to match your customer data to Facebook audiences. Once your offline event set is created, you can use the Create Audience drop-down menu to create a custom audience. On the following screen, assign your custom audience to your ad account and select the audience type from the drop-down menu. Specify the number of days to include in your custom audience, add a name for your audience, and enter an optional description. Click Submit when you’re finished. Once populated, you can select this custom audience in audience targeting when creating new ads in Ads Manager. 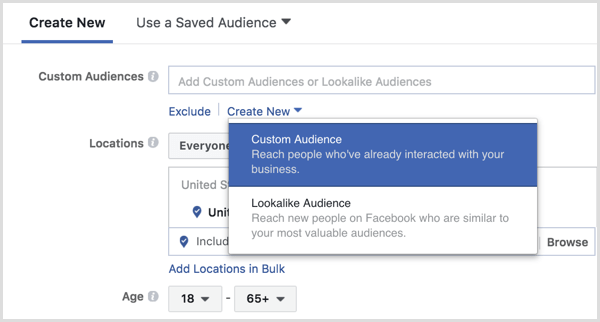 You can also use the Audiences dashboard to create a Facebook ad campaign with your new custom audience. Check the box next to your custom audience and click the Create Ad button above. Want more like this? Explore Facebook for Business!. As you can see, there are different ways to use Facebook events for audience targeting in a Facebook ad campaign. 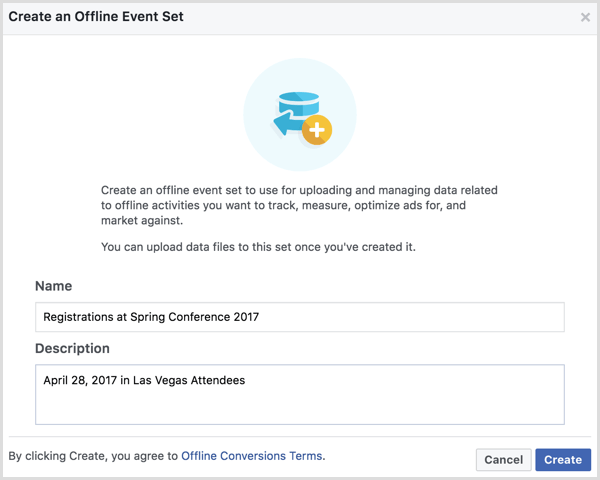 You can also use offline event sets and custom audiences to target actual attendees of your event if you collect and export attendee data. What do you think? 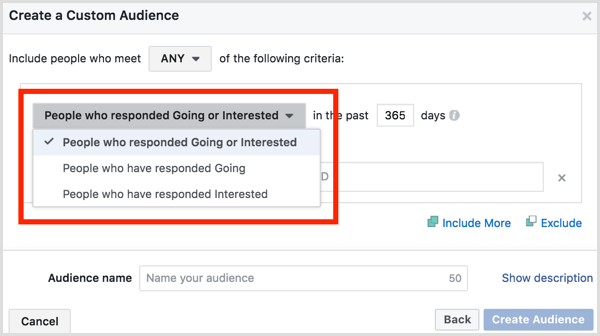 How do you plan to use events for your Facebook ad campaigns? Please share your thoughts in the comments below.